Ian Henderson from the Colinton Inn and Bistro has made the switch to fibre broadband. More than 1,000 homes and businesses in Colinton, Edinburgh are now able to connect to high-speed fibre broadband thanks to the Digital Scotland Superfast Broadband programme. 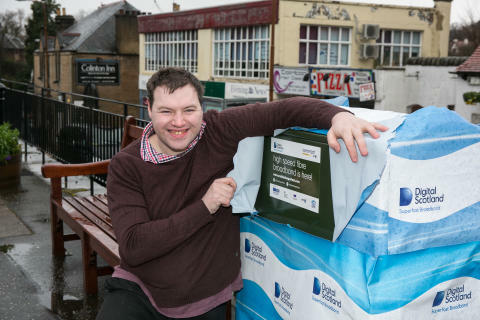 The Digital Scotland team unveiled one of the new fibre street cabinets that will serve part of the village last week with Ian Henderson from the Colinton Inn and Bistro, which has recently switched to the faster speeds available. The latest premises are among more than 715,000 homes and businesses across Scotland which are now able to access fibre broadband through the £428 million Digital Scotland rollout. To access the latest fibre broadband technology, local people need to sign up with an internet service provider, as upgrades are not automatic. Other local areas to benefit from the Digital Scotland rollout, led by the Scottish Government, include Gorgie, Morningside, Balerno and Bonaly. More local coverage will follow as engineers from Openreach, BT’s local network business, continue work on the ground. Ian Henderson said: “It was a pleasure to join the Digital Scotland team to announce more fibre broadband in Colinton. It's good to see this project reaching more communities and giving an increasing number of homes and businesses like ours the chance to connect to high-speed broadband. Sara Budge, Programme Director for Digital Scotland Superfast Broadband, said: “It’s fantastic news that the programme has been able to launch more fibre broadband to benefit residents and businesses in and around Colinton. BT is investing £126 million in the Digital Scotland rollout. Robert Thorburn, BT Scotland’s Fibre Broadband Director, concluded: “Hundreds of Colinton residents can now connect to their best ever broadband speeds when they sign up with a service provider, and we’d encourage local people to check out their options.